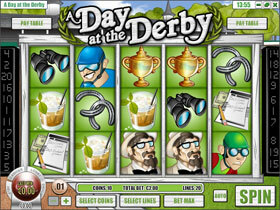 A Day At The Derby is one of Rival's newly launched Video slot consisting of 5 reels and 20 paylines. It has a popular horse racing theme and features a Wild and Scatter icon, Free Spin feature and an interesting Bonus Round. 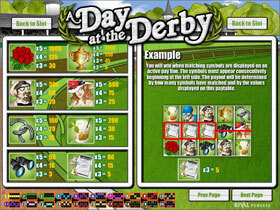 A Day At The Derby has more than 29 winning combinations with different winning icons. The icons on the reels have been perfectly chosen such as the Binoculars, Cocktail, Horse, Horseshoe, Jockey, Lady, Man, Mint Julep, Roses, Track Betting, Trophy etc. The Brown Horse represents the Wild icon that will only appear on reels 1, 2 & 3 and acts as a substitute for the rest of the icons except the Scatter and Bonus icon. The Blue Jockey is the Scatter icon and the key that will trigger the Free Spins. The Grey Horse is the bonus icon and the Green Jockey is the Jackpot icon. 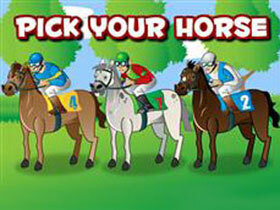 In the Bonus feature, players need to choose one of the three horses that will reward the players with a Bonus prize depending on how well the chosen horse does in the race. A Day At The Derby has superb graphics and theme related icons which provides players with a number of winning opportunities, which are boosted with special features of Wild and Scatter icons, Free Spins, Multipliers, Jackpots and a Bonus round.